Plan a Vegetable Garden . . .
A vegetable garden should do what you want it to, so when planning a vegetable garden, ask yourself what your desired outcome is. Do you want seasonal salads? Maybe lots of root crops, tons of tomatoes, or a bit of everything? Could be you are a backyard all-you-can-grow spud person, or aspire to rich asparagus beds? Hold on a mo. Hard as it is not to just get out there and muck around... do yourself a favour and plan first. For example, to feed a family of four all year round, you will need to plan a vegetable garden that is about 100 sq meters (1076 sq ft) of growing area, not including paths. And remember if you live in a cold climate, that will put the kybosh on growing all year round. So you may need a veggie patch that is larger than normal and then make preserves. Before you do your home vegetable garden plan — where do you live? One of the best vegetable gardening planning tips you should follow is to consider your climate. Whether it's so hot your trowel melts, or so cold that you stub your toe on a clod of earth, climate can roughly be broken down into three basic categories... cold, temperate and tropical/sub-tropical. Obviously there are many shades of climate in these categories and only you can determine exactly what fits into the mix depending on where you live. Here are our useful sowing guide charts for specific information on what vegetables will do well in your area, which is a great help when plotting your plans. You need to identify a good quality source for your seeds. Order seeds well before your growing season starts, especially if you live in a cold zone with a short growing season. No Dig Gardens use organic gardening methods and it's often better to germinate your seeds separately, then plant up as seedlings. Use this germination guide to work out what kind of head start to give your plants. If you are planning big plantings of some things, consider staggering seed germination so they don't all mature at the same time. If you are living in a cold climate, or even a temperate one, it is worth considering starting seedlings indoors, using a cold frame or greenhouse, if the growing season is short or there is a danger of frost. What will grow where in your vegetable garden layout? Different plants have different needs so take that into consideration when planning your vegetable garden. Cold: Plants like broccoli, Brussels sprouts, cauliflower, turnips, onions and peas grow best at temperatures between 10-20C (50-70F). These plants prefer a cooler time of the year to grow and will usually tolerate frost. Cool to warmer: Vegetables like cabbage, carrots, radish, parsnip, leek, lettuce and celery have intermediate temperature requirements. They will grow best in temperatures between 15-25C (60-80F) and they can be fussy. Grow them out of season and they may run to seed without producing anything for your kitchen table. Warm to hot: Particularly corn, capsicum, potato, tomato, eggplant, beans and all the vine crops. These warm season vegetables grow best in temperatures above 20C (70F) and will curl up their toes and probably die if exposed to frost. So make sure the majority of their growing season is in the warmer months. The better you know what you want to grow, the more success you will have. That's why initial planning can save you angst. Nurseries may try to sell you seedlings that are, frankly, out of season. Growing peas in the heat of summer will not see them produce at their best. Check the prevailing wind, and protect your plants from harsh winds. Cold winds will stunt growth, hot winds will dry the soil and harm the plants, strong winds will break them. If you don't have a natural sunny protected corner in your garden, prepare a windbreak of garden lattice or slatted timber. 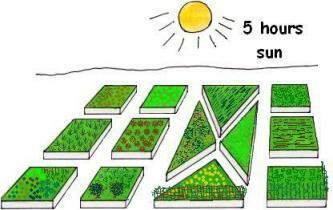 Where does the sun strike your garden, and for how long? Make sure your vegetable garden gets plenty of sunshine... at least 5 hours a day of direct sunlight. Areas with less sun can still be planted with some leafy vegetables and herbs. Make sure your taller plants don't block the sunlight for the smaller plants. Watch how the sun travels in your garden. In the northern hemisphere, consider planting your garden rows in a north to south position with the taller plants at the northern end. In the southern hemisphere, this is reversed with the taller plants at the southern end. This way, all the rows receive an equal amount of sunlight. If you are planning to plant successive crops, practice plant rotation. Different plants take different things out of the garden soil. This will also reduce the potential for a particular type of pest or disease to take hold in your garden. Keep replenishing your compost and mulch! Water, water, water! Vegetables need water to grow and lots of it. 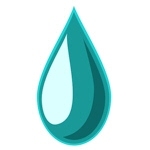 One of the best tips for a vegetable garden layout is to allow for a drip water system. Set your drip system in place in the beginning of your garden planning and it will give your plants a good, deep soaking and will discourage leaf fungus. This will encourage root growth. Do NOT let your garden bed dry out. Your no dig garden will have good drainage anyway, so keep it moist and top it up with mulch to keep the moisture in. Spend some time to work out what you want to grow; what the climate, sun, shade, wind, and shelter are like. Take into account obstacles such as trees, drains, driveways etc; and finally consider the proximity to your house, and the possible interference of pets, children and stray wildebeest... I mean deer, rabbits, squirrels and other lovely but unwelcome pests. By following these basic tips when planning a vegetable garden, your no dig garden will be off to a flying start, you will succeed and the garden will give you many hours of pleasure and satisfaction.